At All Seasons Adventures we strive to deliver the best customer experience and with 15 years of practice, we are pretty darn good at it! Below are some excellent snowshoeing basics, tips and additional info to better prepare you for snowshoeing in outdoors. What to wear and what should I bring? With any winter sport, layers are the key to a comfortable day outside. If you get too warm, your guide will have a backpack to hold onto extra layers. Start with a synthetic or merino wool base layer. This layer will wick away perspiration and unlike cotton still provide insulation even if you do get damp from precipitation or sweat. Wool socks are optimal. Next layer should be a vest or fleece to insulate your body, again a synthetic material is best. On cold days, less than 32* F, a fleece and a vest may be necessary. Last is your outer layer. On really cold or windy days a hard shell is recommended. Aerobic tours and days with warmer temperatures a soft shell is preferred as a soft shell is more breathable. A good winter hat and warm gloves/mittens are nice to keep you warm and manage your temperature as well. Be sure to bring sunglasses as goggles tend to fog and always apply sunscreen. Even on cloudy days the damaging ultraviolet rays of the sun can cause sunburn and are actually intensified by the reflective quality of the snow. What do you provide for the tour? We provide top of the line snowshoes, trekking poles, Neo Gortex cover boots that fit over lightweight hiking boots or tennis shoes keeping feet dry, transportation for your lodging in Park City, water, clif bar, and a knowledgeable guide. We offer a two hour local tour, a four hour Uinta tour, a moonlight dinner tour, and a stargazer tour. The two hour tour is a favorite, however, there are great opportunities to snowshoe further from town if you want to experience a different mountain range or and even after the sun has set on trails minutes from downtown. Our two hour local tour departs in the morning and afternoon. The tour start times were designed to be convenient for our guests that have children in ski school or those who want to enjoy one of the many delicious eateries around town prior to the trip. Departure times are 10AM and 1:30PM. We can vary these times slightly; however, we do offer private tours for those who want a fully customizable experience. Park City has an abundance of trails so we have endless opportunities for snowshoeing minutes from your lodging. Each trail offers great views of the surrounding area, wildlife viewing opportunities and varying level of athletic difficulties. Two hour tour is $85 per person, private tour $140 minimum of two; Prices do not including tax or gratuity. The four-hour Uinta tour starts earlier at 9 AM with a scenic 45 minute drive into the Wasatch National Forest. This tour is great for those who want to get away from Park City and experience a more remote snowshoe experience. The experience will be tailored to you, although the trails are less traveled this tour is appropriate for beginners as well as experienced snowshoers. Stopping at the Samak Smoke House is a favorite with guests. Located on the Mirror Lake Scenic Byway this local favorite offers warm drinks, chili, and their own house smoked natural jerky and cheeses. Four hour tour is $130 per person not including tax or gratuity (2 person min.). The Moonlight dinner tour is approximately one hour and is offered on Deer Valley property. The trip begins well in advance of your dinner reservation after the ski area closes for the evening. We snowshoe along the wide ski runs and through enchanting forest with the moon to light our way and on dark moonless nights we use headlamps. The evening is punctuated by a wonderful dinner at the restaurant that you have chosen. A favorite is Fireside Dining on Empire Pass with delicious offerings of melted swiss raclette cheese, artisan cured meats, hearty fire roasted leg of lamb, stews, freshly baked bread and fine wines. Other popular restaurants include The Mariposa with small plates to encourage conversation or the more family friendly Royal Street Cafe. Moonlight dinner tour is $75 per person not including tax or gratuity; please note you are responsible for making your dinner reservation. Transportation after dinner is up to the guest. Some of our clients love to go out after the sun has set when the dark Utah skies light up with a memory making display of stars. Not only will you see the familiar big dipper but hopefully all seven of Pleiades sisters. Others prefer we can start at dusk and experience the golden hour, with amazing photography opportunities, as the sun sets over the high Wasatch Mountains. Headlamps are provided. Stargazer tour is $85 per person, two person minimum; prices do not including tax or gratuity. How do I determine if I would like a leisurely, moderate, or aerobic tour? During the reservation process we cover the snowshoeing basics and ask what type of pace you would like so you can get the most out of your experience. The great thing about snowshoeing is if you can walk you can snowshoe. We like to say that snowshoeing has a small learning curve; it is like hiking on the snow. It may take a little getting used to but by the end of the tour you will forever have a new way to enjoy winter. Just because you have never been snowshoeing doesn’t mean you can only do a leisurely tour. If you are in peak physical condition, acclimated to the high elevation and looking for a good workout we recommend the aerobic pace. This pace is meant to get in as many miles as possible and you will even break a sweat. If you are looking to stop and take pictures often, talk amongst friend, family or with the guide about the interesting facts of the area or you’re out to just enjoy the scenery a leisurely tour would be the perfect fit for you. Want something in between those two? Moderate tour is the way to go! How many calories does snowshoeing burn? Of course it depends on your pace that you are snowshoeing at, what kind of terrain you are snowshoeing on and if it is a packed trail or if you are breaking trail through fresh deep powder. On average you can burn between 500 to 1000 calories per hour! Talk about a great workout. What kid doesn’t dream of a white Christmas filled with snowball fights, snowmen and hot coco? If your child enjoys being outside and has proper warm winter clothing snowshoeing is a great way to spend a couple hours outside. 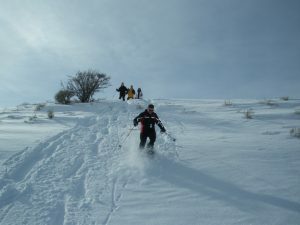 Not every family skis so why not get outside on the snow in a family friendly adventure. Snowshoeing has changed significantly from strictly a mode of transportation to a fun way to spend a day outside in clean crisp mountain air. Here at All Seasons Adventures we would love to take you out for a fun day in the mountains! Hope the snowshoeing basics helped and please call or email with any questions.